For the 2016 Atlantic Hurricane Season I am expecting tracks from north turning systems in the Gulf Of mexico,N.W Caribbean and Bahamas with my highest risk areas in the northern Gulf of Mexico. By: Jim Williams……. 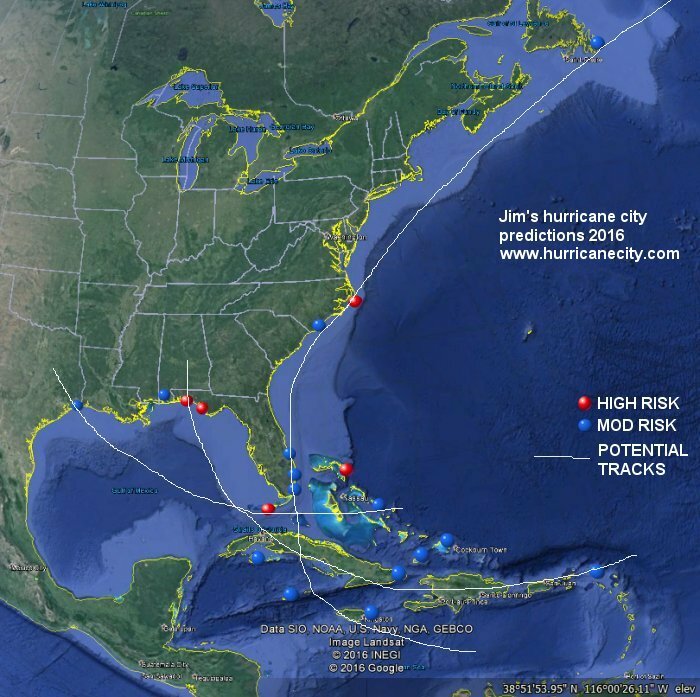 Since 2003 I have chosen 20 locations from the hurricanecity database each year that I think will be affected by a named storm before the season starts. On average two or more of my top five areas ends up getting hit by a tropical storm or hurricane or 11 of 13 years not bad!. Last year my #5 pick Matagorda,Texas was hit by Tropical Storm Bill early in the season just as I said in the video from last year. On the remaining 15 usually 1/3 of the locations I choose will be impacted by the tropical storm force wind field of a named storm. An example of this was last year Hurricane Joaquin the worst of the season hit # 15 San Salvador,Bahamas and impacted #13 Bermuda. This year I have decided to write a blog rather than produce a video mainly due to time constraints, but if you would like to see all past years videos ,maps and results please visit my predictions page. Every year there is usually one or more areas that will be impacted that I do not pick so any area can get hit, but if you are in my top five be prepared to batten down the hatches. As was the case last year I am using eight criteria listed in the order of importance from top most important to bottom least. This year I have added a new predictor (testing) Mexico (pacific side) hit by a hurricane and who gets hit in Atlantic the following season. I am basing my predictions this year on a busy season of roughly 14 to 16 named storms give or take. Statistically due or overdue all storms back to 1871 (yes it means something this is why it has worked). Statistically due or overdue hurricanes only. Trends: example Great Abaco Isl hit by Hurricane Sandy 4 years ago, 7 times they have been hit by a hurricane 4 years later. This worked for Bermuda last year with a rich history of being affected 3 years in a row. Was location in my top 20 last year? Now after adding up all the stats I graph the findings and high lite the qualifiers above in yellow. The most any location met was six yellow boxes which puts them at the top of the list. From there an assortment of tiebreakers is needed which helps me arrive at my top 20. On a side note I have tried to add other criteria such as coastal SST’s in April but after researching the available data it appears there is no connection to local sea surface temperatures and named storm landfalls. In fact in 2005 pre season coastal temps in the Katrina zone were well below normal but above normal when other hurricanes have hit. In 2005 pre season I predicted a heavy hit on Mississippi before the 2005 season started with most of my current criteria. Numerous weather companies and individuals have tried to predict where storms will go often scanning to globe for clues. To this day I have not seen any predictions match my statistical scheme other than vague large geographical areas with small percentage predictions or 30% Atlantic coast av 31% which tells you very little. When I started making these predictions in 2003 I said I would give it a few years and if it fails I will give it up, I had no idea it would be this successful, so lets see if this year is any different. My 20 locations listed on the graph below were picked based on years (14 to 16 named storms) since 1975 due to certainty of satellite viewed storms in the entire basin . 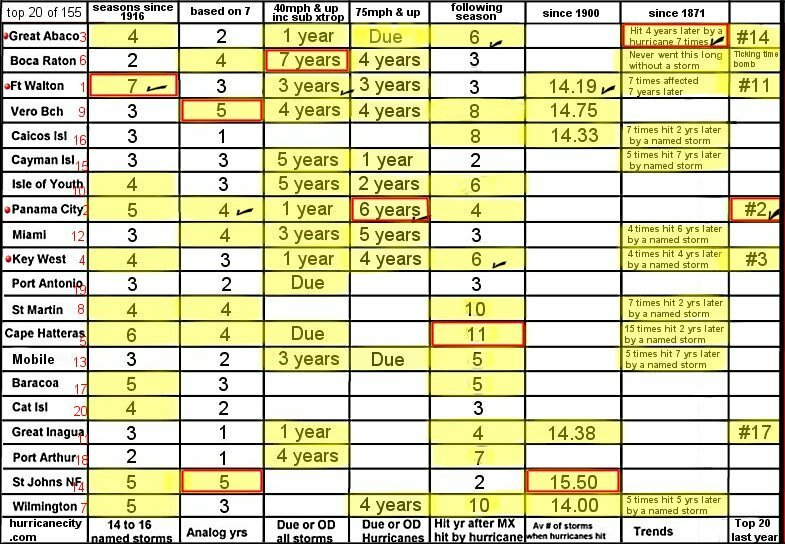 Since 1990 we have seen av decadal numbers of over 110 named storms with 2001 -2010 having 153 or 15.30 storms per year where previous decades av below 100 or -10.0 storms. Red boxes indicate the winner in each category and check marks are for top 5 winners. This year I feel confident that any city or island on this list could be equally affected. It is also important to note that surrounding cities could be equally impacted especially by larger systems. If your location is not on this list it does not mean your chances are any less as a location or two will usually be impacted outside my top 20. « Is Hurricane Joaquin a threat to the U.S?